Made in U.S.A. ©℗ 1993 Geffen Records, Inc. Anyone got the black and white version Sound of Vinyl are selling? Looks like a different tracklist order for Gotta Love It and Fever, or is that just a mistake on the write up? And Don't Stop additional track. Not one of the best. The 1990's kind of sucked for classic rock. The copy of this that you want to track down is the 2lp original pressing. Thick fat analogue sound which slays the CD. 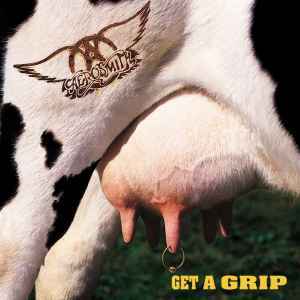 This album is HIGHLY underrated by many and I have been an Aerosmith fan since the old days. Some smokin rockin tunes but with an extra polished production. Living in the Edge, Eat The Rich, Walk On Down, full of classics. 5 star album! Sure, 'Get A Grip' was a commercial success with a ton of airplay on the radio but the band had begun to cave in to the Geffen A&R machine at the point. Gone were the hard rocking, balls to the wall blues grooves of the seventies replaced by songs written by slick commercial writers and made even more successful by videos playing 24/7 on the MTV. If you are discovering Aerosmith for the first time then avoid buying this one out of the dollar bin at all costs and invest a little more by picking up 'Rocks', 'Toys In The Attic' or the debut 'Aerosmith' album instead. You'll pay more but at least you won't be using it as a coaster.